Europe’s three identical Swarm satellites designed to study Earth’s magnetic field from low Earth orbit successfully launched after a wait of nearly two years. 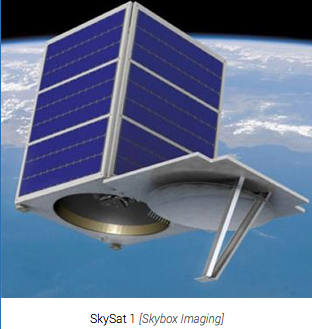 Skybox Imaging, only the fifth organization licensed to provide high-resolution space-based imagery of Earth, launches its first satellite, SkySat-1. Volunteers from AMSAT-UK confirm signals were successfully received from FUNcube-1, one of several cubesats aboard the Russian Dnepr launch in Yasny on Thursday. Honeybee Robotics of New York wins contract from U.S. Defense Advanced Research Projects Agency (DAARPA) for work on experimental satellite servicing and salvaging project known as Phoenix. SpaceX confirms failure of Falcon 9 v1.1 engine to re-ignite September 29 was caused when the igniter fluid lines froze following exposure to oxygen – easy fix reassures insurers and customers including SES on eve of SES-8 launch. Senate bill would require Pentagon to study feasibility of U.S. alternative to the Russian RD-180 engine that powers one of its workhorse rockets. U.S. House Intelligence Committee proposes reduced funding for spy satellites. Boeing to sell commercial Global Xpress bandwidth to government users. Workaround at Army’s Regional Hub Node in Guam boosts Teleport satellite access for U.S. forces in the Asia-Pacific region. STPSAT-3 satellite from the Air Force’s Operationally Responsive Space Office and Space Test Program is successfully launched from NASA’s Goddard Space Flight Center’s Wallops Flight Facility along with 28 other payloads. Satellite Industry Association (SIA) testifies on the satellite industry’s leading role in commercialization of space at hearing held by House Committee on Science, Space, and Technology’s Space Subcommittee. Dnepr launch from Yasny air force base in southern Russia carries 33 international satellites into orbit, including DubaiSat 2 Earth imaging satellite, STSAT-3 infrared astronomy satellite, SkySat-1 earth imaging satellite, Aprizesat 7/8 asset tracking data satellite, UniSat biomedical experiment satellite, and several cubesats. Argentine state satellite company Arsat and its Italian counterpart Telespazio have signed a MoU that calls for collaboration in the space sector, including launch support, space operations, and satcom services. Arianespace orders ten new Vega launchers from Italian manufacturer European Launch Vehicle (ELV). Mars 2020 rover to include test device to tap planet’s atmosphere for oxygen. Surrey Satellite Technology Limited’s space-based S-band radar system, NovaSAR, wins innovation award from The Institution of Engineering and Technology (IET). Private manned U.S. Mars mission will not get off the ground as planned in January 2018 unless it secures support of the U.S. government within the next few months. Successful launch of Air Force experimental satellite lets scientists breathe easier, after NASA’s Glory climate-monitoring spacecraft was lost due to a March 2011 launch failure. 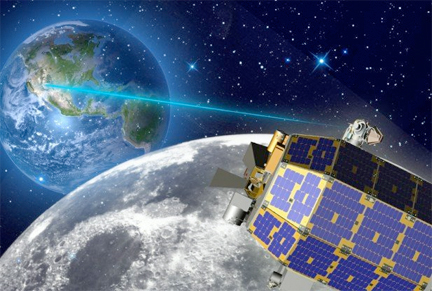 Alphasat reaches operational in-orbit position, successfully completing all in-orbit tests. World Technology Network names ViaSat as 2013 award winner for creation of transformational high-capacity satellite system. Air Force Space Command looks at ways to drive down cost of terminals and unveils new strategy for acquiring satellite capacity. NSR’s Land Mobile & Handheld Satellite Markets (LM&H) report offers the industry’s most comprehensive analysis of this vital and evolving satellite communications market. Liberalised regulatory regimes have opened up markets in Africa that previously posed significant challenges for operators and service providers, and the African market… is open for business. RRsat is appointed as Inmarsat distribution partner for Broadband Global Area Network (BGAN) services. ITU plays key role in bringing communications to some of worst hit areas of the Phllippines. SMART Communications and Thuraya deploy mobile satellite handsets to establish critical connectivity in the Phillipines. Post Italiane selects Eutelsat’s Tooway satellite broadband service to take true broadband across Italy. Astrium announces new SKYWAN 5G satellite platform that fulfills all roles in the network at AfricaCom. The 3rd Space Operations Squadron will celebrate the Defense Satellite Communications System B10 satellite’s 20th anniversary on orbit Nov. 28 – the satellite was designed to operate for only 10 years. Musings from a trip to SatComRus 2013 held in Dubna, about three hours north of Moscow, where Russia’s top satellite executives meet to discuss the industry in one of the world’s major satellite communications markets. Radio manufacturers announced that they have achieved important milestones in the fielding of terminals that will connect to the Navy’s long-delayed Mobile User Objective System communications satellites. Alcatel-Lucent to provide Japanese cable operator Tonami Satellite Communications Television with ultra-broadband access solution, increasing speed to customers by up to 20 times. Yahsat enters into agreement with Astrium and Boeing for Ka-band capabilities for maritime patrol aircraft. SIS Live selects Ateme codecs to equip new fleet of satellite news gathering vehicles. Hunter Communications is approved by Industry Canada to compete in the Canadian market, and begins selling space segment. 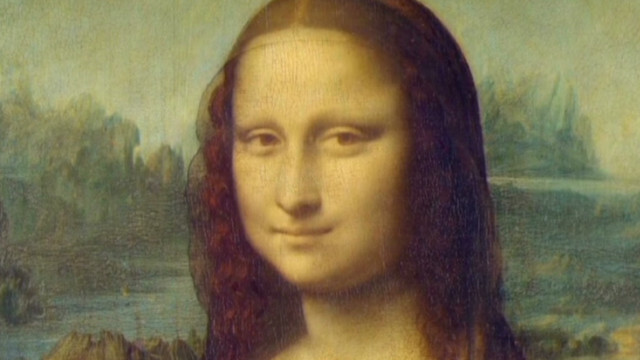 NASA successfully transmits digital image of Mona Lisa to satellite orbiting the moon and back using lasers. Via Satellite dedicates edition for the Middle East & Africa region, both vibrant regions with strong demands for capacity, with Africa possibly the next big hotspot for satellite. Harris Corporation unfurlable mesh antenna reflectors on MUOS satellite launched in July successfully deploy in space. Australian government is considering its options after iiNet announced it would no longer sign up any new customers to the National Broadband Network (NBN) interim satellite service as it reaches its limit. Incredible Connection partners with Maxwell Technology to bring high-speed satellite broadband to South Africa, especially suited for the agricultural and hospitality industries. Canadian government issues request for proposals for mobile satellite communication terminals for Canadian Army vehicles. Senate Intelligence Committee recommends allowing U.S. firms to sell higher-resolution satellite imagery on the open market. European Commission will offer “free, full and open” access to the Earth observation satellites providing data for the commission’s Copernicus program starting in December. 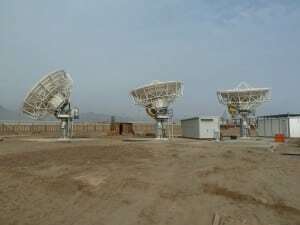 U.S. Navy resumes work on MUOS ground station following six-month standoff with Sicily. Galileo prime contractor said it had completed development of the first satellites earlier than planned, and that this will compensate for the late start in testing and later-than-planned delivery to the European Space Agency (ESA). Echostar’s HughesNet consumer broadband service outpaces ViaSat’s Exede service with 72,000 net subscriber additions in third quarter; company announced it is paying Dish Network to continue TerreStar 2 construction, without disclosing satellite purpose. With its North American business recovering and second-generation satellites in service, Globalstar looks to Latin America and other International markets. Private-equity group Ardian has purchased 30 percent stake in satellite-based environmental data collection and positioning service provider CLS of France; cash needed to pursue internal and acquisition-fueled growth, including U.S. market. The second annual Visions Awards ceremony at SATCON awarded winners in three categories: David Hershberg, Founder and CEO of Globecomm Systems won the Visionary Executive of the Year; Advantech Wireless’ SapphireBluTM series High Power Amplifiers won the Innovative Product of the Year and satellite operator Arabsat won the Most Promising Company of the Year. SMART communications and Thuraya deploy mobile satellite handsets to establish critical connectivity in the Philippines. Thaicom Plc installs satellite-based communication facilities using its IPStar or Thaicom 4 satellite for typhoon Haiyan-hit areas in Philippines. UK-based satellite technology company Avanti partners with IP communications services firm Internet Solutions to provide enterprise services in South Africa. South Korea’s indigenously built STSAT-3 “Science and Technology Satellite 3” scheduled for November 21 launch from Russian Yasny launch base. 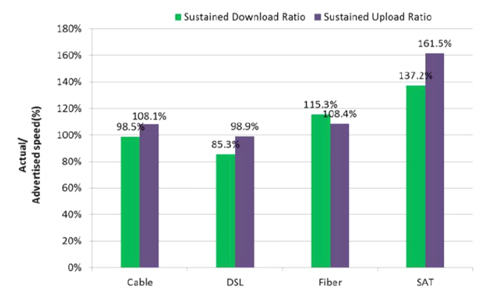 Broadcast industry needs reality check on where we stand today in terms of encoding standards for SD, HD, and 3D channels, with fully 73% of SD channels still MPEG-2. Although satellite broadband has grown slower that predicted three years ago, new NSR report says 2013 represents a landmark year for that market. ISRO selects Arianspace for Gsat 15 and Gsat 16 launches. Though Astrium is being merged with Airbus due to under-performance, its satellite and space-transportation businesses have been doing well. Lockheed Martin Space Systems division to close its Newtown, Pennsylvania facility by 2015 as part of corporate-wide cost reduction including workforce reduction of 4,000. Globalstar’s Spot releases satellite-based theft-alert tracking device. Responding to growing consumer demand to watch favorite content on mobile devices, DISH readies upgrade to DISH Anywhere app that incorporates Transfers functionality to iOS and Android phones and tablets. Tampa Microwave to design satellite terminals for Inmarsat’s Global Xpress satellite network. Emerging markets push global Pay-TV subscriber base past 886.5 million in third quarter of 2013. NASA’s MAVEN (Mars Atmosphere and Volatile EvolutioN) satellite scheduled for November 18 launch from Cape Canaveral. SES advised by Arianespace that ASTRA 5B satellite launch will be delayed to January of 2014 due to delay in co-passenger satellite Amazonas 4A. Newtec wins ASBU BroadcastPRO Outstanding Achievement Award for its pivotal role in developing new DVB-S2 extensions technology. Comcast Wholesale renews and expands key agreements with SES for nearly 650 MHz of C-band capacity to deliver solutions to media companies across North America. English ITU dispatches emergency satellite communication equipment to areas of the Philippines severely affected by Typhoon Haiyan. ITC Global completes capacity deal with SES to connect remote oil, gas and mining operations throughout North America. Eutelsat signs deal with Rai to expand HD broadcasting in Italy. SES-Astra’s SAT-to-IP protocol allows any of 32 users with device having an IP address to receive up to 6 satellite TV programmes simultaneously. Gilat Satcom announces new fibre and satellite services in Africa which will increase broadband availability. OnlineAVL2 Fleet Tracking Platform, with satellite communications option, provides continuous visibility of heavy equipment and on-road vehicles. Mobile Satellite Communications Survey, Prospects to 2022, is an expert analysis of the mobile satellite industry from MarketResearchReports.Biz. Russia launches Russian Defense Ministry communications satellite. Airlines and air navigation service providers meet with Aireon for space-based ADS-B advisory committee meeting. EIAST hosts international committee on Global Navigation Satellite Systems. iDirect wins 2013 Via Satellite Excellence Awards for Technology Company of the Year and Social Media Company of the Year. ViaSat’s military business still growing despite U.S. Government cutbacks. Kore, world’s largest wireless services provider specializing in global machine-to-machine (M2M) communications, adds broadband satellite services from Inmarsat. Encompass implements ScheduALL across the U.S.; the UK is to follow. ND Satcom’s next generation SKYWAN 5G significantly reduces total cost of ownership since only one type of device is needed for all roles in the network. Navman wireless adds satellite communications option to its fleet tracking solution. Ericsson’s latest Mobility Report gives the latest trends in the wireless industry, relevant to the satellite industry in light of cellular backhaul services. Spacecom secures financing for Amos 6 satellite. First Global Xpress satellite nears launch. Telecoms Sans Frontieres (TSF) and United Nations Disaster Assessment ad Coordination Agency (UNDAC) work together to deploy satellite communications support in Philippines. SES and its partners in emergency.lu deploy satellite communications in Philippines. British engineers demonstrate use of Ka-band for much higher bandwidth support of UAVs. Belgium-based SatADSL to launch new range of satellite services for African enterprises. Canadian government reaches out to other countries and companies for partnership on massive Arctic satellite communications program. Russian rocket carries Sochi Olympic torch and three astronauts to the International Space Station. Even in a tough fiscal environment, the satellite industry gathered in record numbers at Global Milsatcom 2013 in London to present their latest solutions for military users. U.S. allies’ access to MUOS debated after a MUOS satellite in geostationary orbit successfully maintained telephone links with an aircraft flying over the North Pole. SES-8 satellite, which provides SES both replacement capacity and additional transponders for new business, is now scheduled for launch Nov. 22 aboard a Space Exploration Technologies Corp. (SpaceX) Falcon 9 rocket. Orbcomm feels its strategic partnership with Inmarsat to develop satellite M2M could help standardization efforts in the industry. Problems with the Exelis-built navigation payload on the U.S. Air Force’s next generation of positioning, navigation and timing satellites appear to be solved. Lockheed Martin Space Systems has concluded that disaggregation of space assets to render them less vulnerable to attack is not all it’s cracked up to be. Pentagon could reduce its reliance on foreign-owned satellites like the Apstar-7 by increasing its supply of bandwidth or decreasing its seemingly limitless demand. Canada revamps satellite regulations to make industry more competitive, reducing fees, easing coverage restrictions for satellite licensees, and going to bat for them seeking orbital slots outside the Canadian arc. Later than planned launch of its new GX satellite to hit profits of Inmarsat. Russian military satellite to blast off atop Proton-M carrier rocket November 12, with no details on the purpose or specifications of the satellite. Northrop Grumman gets $18.5 million contract to build SATCOM capability for E-6B strategic airborne command post. MTN Communications renews critical capacity agreement with SES as cruise ships, yachts and exploration vessels worldwide demand more connectivity. SpeedCast extends global maritime VST network across Indian and South Atlantic oceans. ORBIT Communication Systems to show OceanTRx stabilized VSAT product line for maritime oil and gas communications at OilComm 2013. Why satellite TV has an edge over cable. Kinross Gold signs three-year deal with BT to provide communications network connecting sites in the U.S., Canada, Brazil, Chile and Spain. Integrated marketing and communications agency Sage Communications acquires satellite and space marketing and public relations firm Longbottom. Research and Markets report projects the mobile satellite service market to grow at a CAGR of 10.1 % over the period 2011 – 2015. DARPA looks for 10 retired satellites to raid for parts in on-orbit salvaging demo. Canada blocks MDA from Russian radar satellite competetion. FEMA wants to extend contract for satellite connectivity with On Call Communications for extra three months at additional $450,000 cost. Com Dev and MDA jockey for position on Canadian Arctic satellite project. Australian company EM Solutions gets follow-on order from Japanese government for additional quantity of its on-the-move satellite broadband terminals. Azam Medial chooses Eutelst capacity, services, and DTH experience to support its new pan-African pay-TV platform. Navman Wireless USA announces a new satellite communications option for its OnlineAVL2 fleet tracking platform enabling continuous visibility of both heavy equipment and on-road vehicles even when out of cellular range. NASA working hard to develop laser-based space communications systems said to be key to ensuring rapid and accurate transmission of information from spacecraft around the solar system. Euroconsult – Government and industry to combine for 1,150 satellites over next ten years. Spacecom’s Amos 4 satellite Ku-band capacity bought entirely by a Southeast Asian data services provider. ITC Global announces it has launched the world’s first production service for oil & gas and mining clients utilizing the new iDirect X7 remote modem, offering remote location performance of 20 Mbps or better. Thuraya partners with Vocality to provide Vocality network router solutions through its global network of service partners serving commercial and defense mobile satellite communications markets. India’s attempt to become just the fourth nation to successfully send a mission to Mars makes good start with successful blast off of the Mangalyaan orbiter. New satellite communications building opening at Goonhilly will provide super fast broadband from Avanti to rural areas of Cornwall that would otherwise be out of reach. Kazakhstan provided Kyrgyzstan joint use of KazSat to offer satellite communications and broadcasting in the interests of the telecommunications sector in Kyrgyzstan. Globalstar proposal to use satellite spectrum for terrestrial Wi-Fi has potential for success, unlike the fiasco that was LightSquared. Thuraya and TrustComm introduce Starlight, and enhanced mobile satellite service. Euronics of Germany teams up with Eutelsat to take satellite broadband to German consumers still beyond range of a quality broadband experience. Hughes to provide satellite back-up solution for the US National Weather Service OPsnet (Operational Systems Network). ESA’s ground station on Tenerife island receives laser signals over a distance of 400,000 km from NASA’s latest moon orbiter, the Lunar Atmosphere and Dust Environment Explorer (LADEE). Fourth edition of NSR’s SCADA/M2M via Satellite report offers the industry’s most complete analysis of this vital satellite communications market. 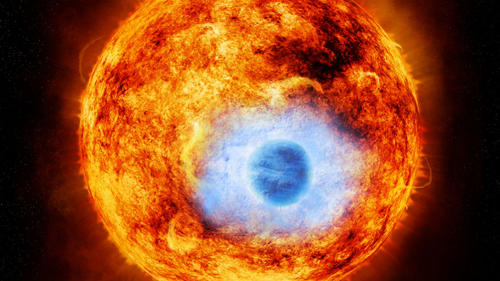 In the search for Earth-like planets, astronomers uncover a strange blue world. 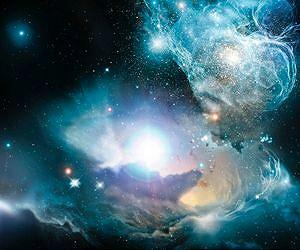 Scientists estimate more than 100 billion planets exist beyond our solar system. These alien worlds, known as exoplanets, orbit distant stars located light-years from Earth. One such planet is called HD 189733b. A gas giant slightly larger than Jupiter, HD 189733b circles its star from a distance of only 3 million miles. That’s 13 times closer than Mercury is to our sun. As a result, temperatures in its atmosphere approach 2,000°F. 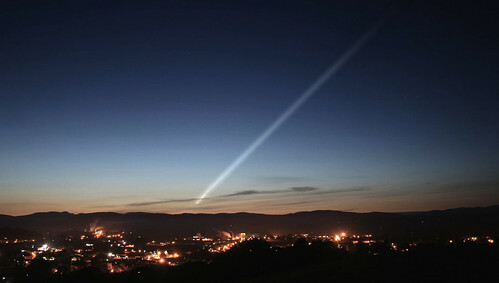 Astronomers discovered HD 189733b in 2005 after observing its parent star dimming with every pass, or transit, of the planet. We now know from follow-up observations by NASA’s Hubble Space Telescope that HD 189733b is blue in color. If only the original Star Trek was still around — they’d come up with a good episode around these “Hot Jupiters.” This one’s only 63 light years away. We’re hoping our friends at BigBangPrints.com come out with an exoplanet gallery soon. For now, we’ll settle for regular Jupiter. Mike Ford was the creative genius behind Americom’s branding campaign, launched in 2006, and encouraged the creation of this blog. 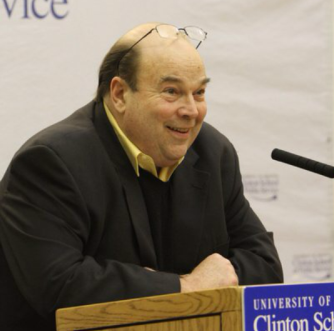 Michael Francis Ford, a noted Democratic political strategist, entrepreneur and founder of the Center for the Study of the American Dream at Xavier University, died on November 5 at the Johns Hopkins Hospital in Baltimore, Md., after battling melanoma for five years. He was 65. Over four decades, Mr. Ford served in nine presidential campaigns, holding senior strategic positions for Edward Kennedy in 1980, Walter Mondale in 1984, Jerry Brown in 1992 and Howard Dean in 2004. In addition, he managed more than 100 gubernatorial, US Senate, US House and mayoral campaigns across the country. After graduating from Xavier University in 1970, Mr. Ford remained in Cincinnati, Ohio where his political career blossomed. In addition to numerous local and statewide campaigns, Mr. Ford served as Executive Assistant to Ohio Governor John J. Gilligan. He later served as campaign manager, Deputy Mayor and Chief of Staff to Cincinnati Mayor Jerry Springer, and was as an international representative and organizer for AFSCME, AFL-CIO. In 1980, Ford was part of a cadre of seasoned political veterans who helped lead Senator Edward Kennedy’s challenge to President Jimmy Carter for the Democratic presidential nomination. Among other assignments, Ford managed Kennedy’s crucial Pennsylvania primary win, which breathed new life into the campaign at a critical time. In 1984, while serving as Deputy Campaign Manager and National Field Director for Vice President Walter Mondale’s presidential campaign, Ford’s persuasive post-primary memos urging an ambitious effort to register minority and union voters and advocating for an “out-of-the box” selection for running mate, were published in The Quest for the Presidency, 1984. Mike taught and inspired legions of young volunteers and first-time staffers and turned them into the next generation of political professionals. In 1988, Mike and his wife, Sally, founded Bay Communications, a strategic communications firm, consulting for executives of Fortune 500 companies, Democratic national and state parties and caucuses, international unions, and political action committees. While serving in the 90’s as the Senior Advisor to the Executive Vice President of Internet Operations at Citibank, Mr. Ford created the “Financial Services in the Next Ten Years” White Paper, helping Citibank focus on company-wide long term planning, including voice recognition and A/I, universal/simultaneous multi-lingual translation, and miniature robotics as virtual guides for consumers. In 1996, Ford created the Affordable Access Trust Inc., a unit investment trust filed with the SEC, designed to package low cost units of Warren Buffett’s Berkshire Hathaway Corporation, at the time trading at $50,000 a share. The Trust was terminated after Buffett to reluctantly created lower cost “Berkshire B shares” at a 96% discount from the “A share” price. The B shares have quintupled in value since then. “I just wanted to let the average person buy a piece of the best investor of our time,” Mr. Ford told Newsweek. Mr. Ford’s unique career afforded him the chance to consult a variety of clients, ranging from the NBA Players’ Association, the New York City Metropolitan Transit Authority, and many technology start-ups. Mr. Ford was even enlisted by the producers of the 1983 film The Dead Zone to help create scenes about a New Hampshire primary election event. In 2009, Mr. Ford founded the Center for the Study of the American Dreamat his alma mater, Xavier University. The Center serves as the nation’s pre-eminent clearinghouse for information on the state of the American Dream. As its Founding Director, Mr. Ford led the Center’s efforts in generating significant original research analyzing shifts in the Dream’s continuing evolution. Under Mr. Ford’s leadership, the Center has received significant national attention for its work. Mr. Ford’s commentaries appeared in radio and newspapers including The Chicago Tribune, and The Cincinnati Enquirer, The Cleveland Plain Dealer, and Huffington Post, He appeared on “Larry King Live,” the “Today Show” and CNN’s “Crossfire,” serving as a political analyst and campaign spokesperson. He lectured at Harvard’s Kennedy School of Government, Ohio State University, American University, University of Cincinnati, Wake Forest University, and the Clinton School of Public Service at the University of Arkansas. Mr. Ford was such an avid reader that his home contains a two-story library filled with thousands of books and busts of his Founding Father heroes. His many passions ranged from writing, classical music, American history, financial investing, art collecting, cooking, and his favorite sports teams, most notably the Washington Redskins and Xavier Musketeers basketball. Mr. Ford was born in Washington, D.C. on June 27, 1948, and grew up in Takoma Park, Md. He attended St. Michael’s School in Silver Spring, Md. and St. John’s College High School in Washington, D.C. He received an A.B. from Xavier University in Cincinnati, an M.A. in Government from Georgetown University in Washington, D.C., and was a Graduate Fellow at the Institute of Public Administration at Penn State University. Surviving Mr. Ford are his wife Sally, of Glyndon, Md. ; a son, Matthew of New York, N.Y.; Mary Jo Ford (Richard) Schneider of Herndon, Va., Patrick (Peggy) Ford of Columbia, Md., Christopher Ford of Detroit, Mich., and Maureen (Dave) Jester of Damascus, Md. ; numerous nieces and nephews, and other family and friends. The family suggests donations in Michael’s memory to the Center for the Study of the American Dream, Xavier University, 3800 Victory Parkway, Cincinnati, Ohio 45207-5471; or to the continuing research efforts at Johns Hopkins University, c/o Dina Mallis Klicos, Kimmel Cancer Center Development Office 750 E. Pratt Street, Suite 1700, Baltimore, Md. 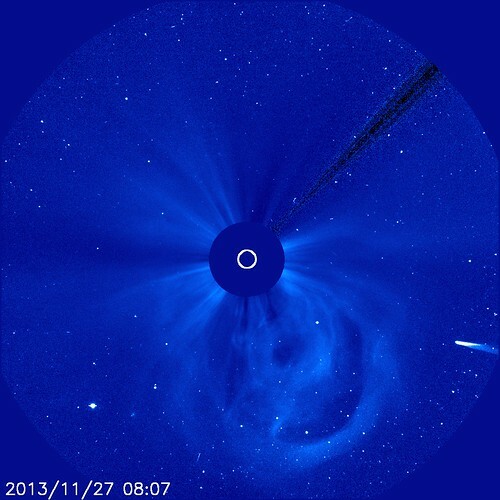 21202. Please indicate that the donation is in memory of Michael Ford. With heroic symbolism, Mr. Ford died on Election Day.